The degustation at Arras is a wonderful experience, culminating in the most impressive petits fours I've ever set my eyes on. Here for an anniversary dinner on a rainy Saturday evening, we're off to a great start with the amuse bouche, a small mound of turnip, pistachio and orange. It's the perfect combination of sweet and savoury with an added bonus of nuttiness. The balance of flavours is spot on. 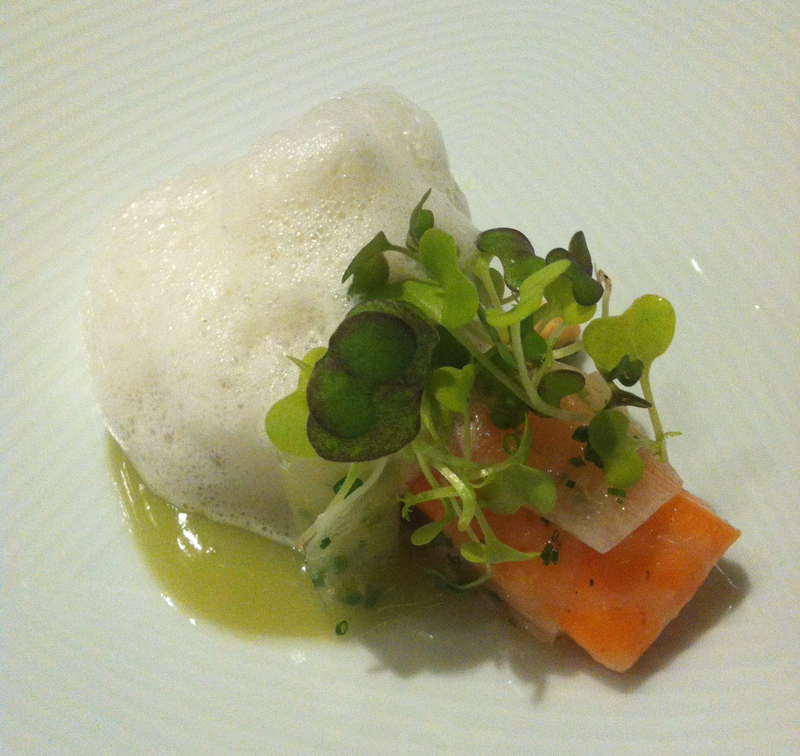 Next up is a delicate dish of poached salmon, tonka bean foam and lime puree. Notes of sweet and sour are melded together beautifully, and the salmon is impeccably soft, making it one of my favourite dishes of the night. The savoury porridge, chestnuts and almond cheese dish is one of the most adventurous of the menu. I was expecting something that was more the texture of a breakfast porridge, but instead they're cooked grains in a chestnut puree. There's a beautiful salty tang from the almond cheese and a contrasting sweetness from the chestnuts. The plating of the prawn, artichoke and grapefruit is lovely and boasts gorgeous colours, but flavour-wise we find it's a little bit lacking. It's probably our least favourite of the bunch. But the Chatham Island blue cod, fennel, salted grapes and eel broth is wonderfully elegant. The fennel custard is a stand-out component. We thoroughly enjoy the bavette, horseradish, burnt onion, fried curd and dressing. The burnt onion puree packs a punch, and the fried curd is a nice touch. We continue with more meat: Minty Hill lamb rump, pumpkin, ras el hanout and mushrooms. The attention to detail is commendable - I like the grid-like incisions on the mushrooms and the flakes of dried mushroom on the side. The smooth pumpkin puree is wonderful, but we're not huge fans of the pumpkin hemispheres (I think they're pickled). We go all out and have the cheese course (optional supplementary $25). One of the staff comes around with a trolley of cheeses – you pick four and are given a bowl of condiments, including green apple slices, grapes, quince paste, thin lavosh and biscuits. We end up picking very strong cheeses, which may have been a bad move, considering we were already getting very full. For the dessert courses, we are first served the rhubarb, cranberry, raspberry and "chai", featuring a great interactive moment where the chai is poured over the frozen rhubarb ravioli and caramelised meringue in a liquid nitrogen cloud. The frozen raspberries warm up and the vibrantly red jelly swims in the broth. It's light, fresh and fruity with a hint of spice from the chai. The second dessert course is an assembly of mascarpone, coffee ice cream and grappa jelly. The grappa jelly has a strong aniseed flavour which is a little overwhelming, but otherwise this is a beautiful dessert. The many textures are a delight and the aroma of coffee is powerful and perfect. And then it's time for the petits fours. It's a mindblowing experience where you are allowed to pick up to three, as long as you finish them. The selection is amazing and almost overwhelming. I was also on the verge of exploding, so I highly recommend leaving space for these beautiful morsels of sweet deliciousness. I love how in almost every dish at Arras, there are multiple ways an ingredient is prepared and presented. It's playful and clever, and it makes the dining experience that much more interesting. The bright room has a clean look with a white and navy colour palette. Striped navy armchairs and matching carpeting are countered by an artsy feature wall. The degustation is $140 per person, and if you're having the accompanying wines it's an extra $80. There's also a discretionary 8% service fee. Why? 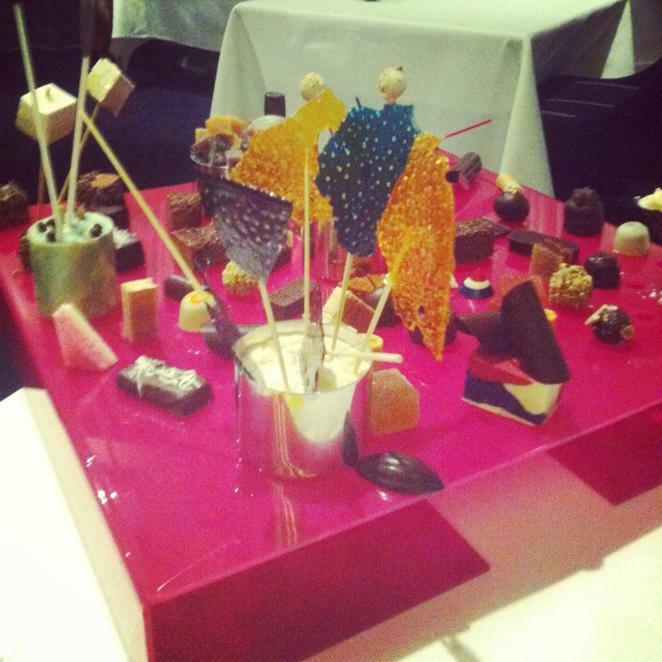 You can pick your own petits fours! That looks like true gastronomy; some really unique dishes there. I like the idea of raspberry ravioli. The dishes looks too pretty, how do they taste? need to try. Looks very interesting, especially the size of the servings. I hope they serve quality instead of quantity.